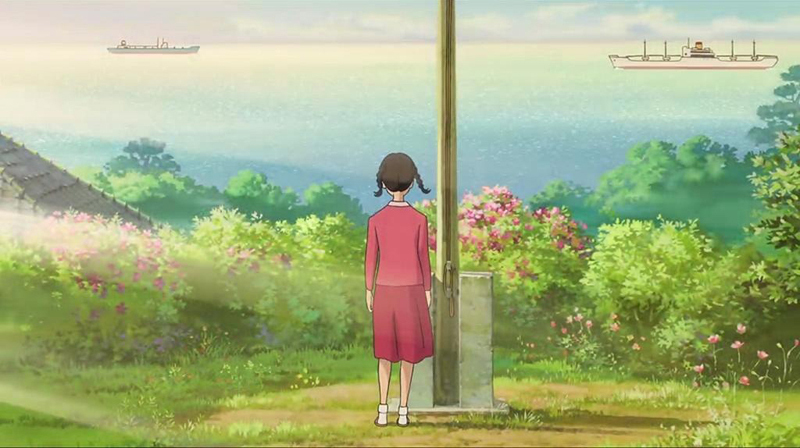 Like any Studio Ghibli movie, From Up On Poppy Hill is a 2d/hand-drawn animation film. The attention to detail is astounding, which is most evident when the main character Umi Matsuzaki enters the clubhouse Quartier Latin for the first time. However, my main gripe with the artwork is how similar the faces are. With a simple change of hairstyle, they are a different character, which somewhat bothers me because it makes everyone seem too homogenous. There are a few characters who stand out from the sea of clones, but I emphasize on the word “few.” I was also a bit bothered by the way the characters walk because, to me, it looked a little stiff. These criticisms are still drowned by the gorgeous landscape artwork. I think it’s amazing how they are able to juxtapose a quaint Yokohama with a bustling Tokyo. The music is by far what makes From Up On Poppy Hill very enjoyable to watch. Maybe it is because I remember hearing Sukiyaki as a kid, or maybe it is because I am a sucker for jazz or swings (at least, I think it’s swings) music. Aoi Teshima’s vocals is so lovely and soothing, and it strikes a chord in hearts while setting the tone for the movie. I think the music makes the movie feel more realistic and accurately portrays the time period. The english dub trailer did not give so much of the plot away unlike the japanese trailer, so there was one part of the storyline that made me literally go “what the frick.” The plot is simple and straightforward. I felt like the movie reveals a portion of Umi Matsuzaki’s life rather than telling a grand story of how she went through some hero’s journey. I am curious how much the movie differs from the book, and whether character development takes place in the book. I did not watch the film in English, but I did see cutscenes in English on YouTube. From what I gathered from those, Anton Yelchin is perfect for Shun Kazama. I have no complaints of the Japanese voice acting because each voice matches his/her character’s appearances. Overall, I recommend watching From Up On Poppy Hill if you are a Studio Ghibli fan or if you want to watch something on these hot summer days. There are mixed reviews of the film; however, I think the film shows Gorō Miyazaki’s potential and it is step-up from his previously directed film.